"The number of wildfires has increased over the years. In the 1980s, wildfires burned on average 2.98 million acres a year in the U.S. However, between 2003 and 2012, an average of 7.26 million acres burned each year. The average length of the annual fire season has grown by 78 days over the last four decades. 'Because they aren't getting any water, the trees are in danger and won't survive, creating more fuel for fires,' [Malcolm North, a research ecologist with the U.S. Forest Service] said. North added that the level of destruction this year's fire season brings will depend a lot on luck. 'All we can do is hope for more rain and hope we get some," he said. "But we've had years of dry conditions, so it will take a lot of rain for a long time to prevent the fires.'" 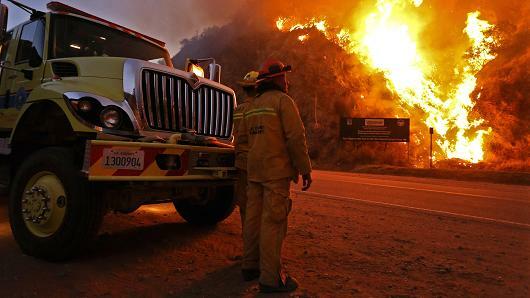 Above: "Firefighters monitor the Colby Fire on Highway 39, January 17, 2014, in Azusa, California." Courtesy of CNBC.